The official recovery of the body took place on September 23, 1991 under the supervision of Professor Henn from the Institute of Forensic Medicine of the University of Innsbruck. Due to low nighttime temperatures, the body was again frozen stuck into the ice and was finally freed with the help of ice picks, ski poles and ice axes. During the recovery process, bits of fur, leather, straps, string and clumps of hay were uncovered and collected. A flint dagger with a wooden haft was also pulled from the meltwater. 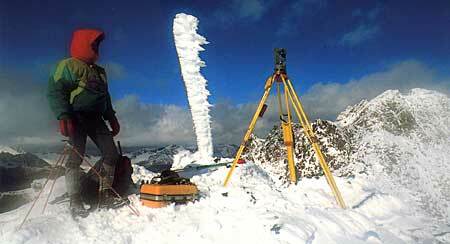 The sheet of ice was between 60 and 100 cm (2 - 3 1/2 feet) thick and was covered with a fresh layer of snow at the time of the excavation. The glacier mummy, now known as The Iceman, was packed into a body bag along with his belongings and sent to Vent by helicopter. The glacier mummy then continued to Innsbruck in a hearse. 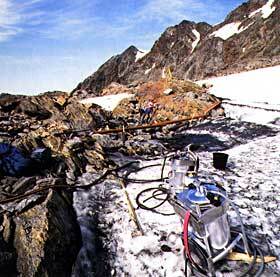 A first location examination at the site where the Iceman was discovered took place October 3 through October 5, 1991. A steam-blower and dryer were used for the excavation. 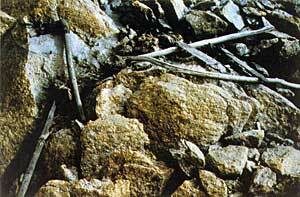 Bits of a net made out of grass rope, pieces of fur and leather, and the remains of a birch bark container with its contents were found. 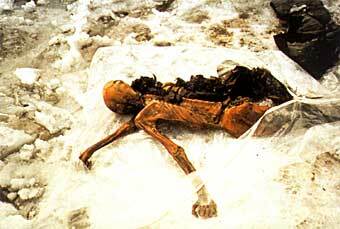 Remains of the Iceman's grass cloak were discovered on the stone slab where the mummy had laid. 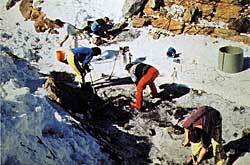 Further excavations found more leather, grass, and fur and more of the Iceman's equipment. The Iceman's fur cap, bits of skin, muscle tissue, hair, and one fingernail were also recovered. Repeated speculation that the mummy had been found on Italian territory made the clarification of the border question necessary. Confusion was caused by the Treaty of St.-Germain-en-Laye between Austria and the Allied and Associated Forces in 1919, as the border was drawn along the watershed between the Inn and the Adige valleys. At the time of the treaty, it was not clear on which side the area of the Tisenjoch was on because it was covered by the glacier. 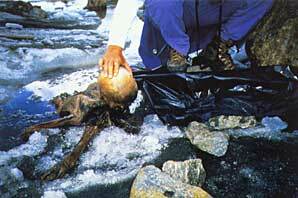 The Iceman was found in an area that now drains off toward the Inn. An official new survey of the border region was needed. It was determined that the location of the find was on south Tyrolean territory, just 92.56 m (less than 300 feet) from the frontier. The Province of South Tyrol claimed property rights, but the find was entrusted to the University of Innsbruck for scientific examination.